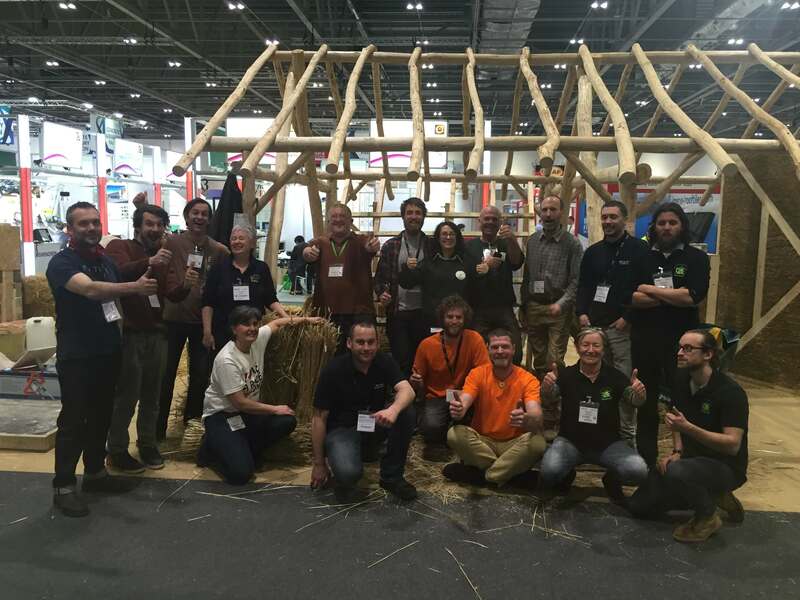 Who would have thought 10 years ago that our passion for thatch, wanting to share our knowledge, enthusiasm in promoting it as a natural, sustainable and therefore viable roofing material would have led to us being invited to Ecobuild 2016 at Excel in London? The power of social media and our interest in Natural Building had a lot to do with it but imagine the surprise when we got that phone call. 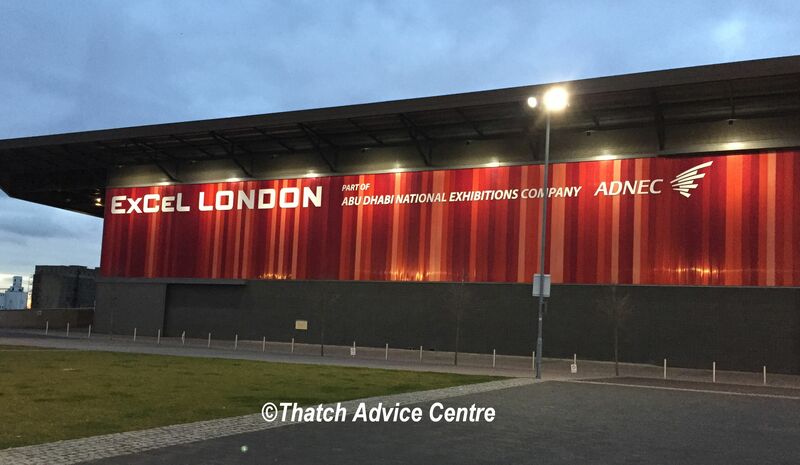 That phone call came just over 2 weeks prior to Ecobuild 2016. Were we interested… well yes but what was involved. 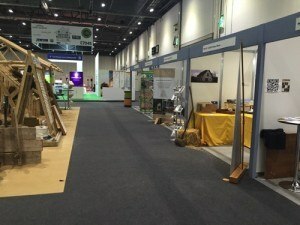 A stand, several demonstrations over the 3 days and the opportunity to meet others involved in Natural Building. 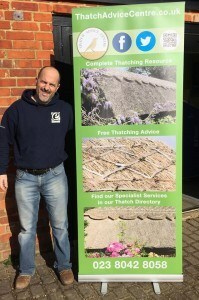 Master Thatchers Simon Crouch and Chris Essex, two of our Thatch Advice Centre Associates who have been helping us for several years were asked – they said yes so off to a good start. 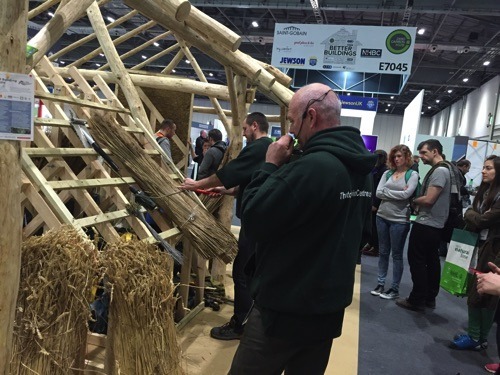 They were asked to make a frame for demonstrating thatch and to source the materials, Water Reed and Straw for starters. Local Businesses were then called upon, we needed more Thatch Advice Centre contact cards, along with a banner and a roll out display. The walls would need information on too so hundreds of pictures to be sorted out and sent for printing and laminating. Thanks to our local businesses for their help, Greenwood IT, The Exhibitionist and Totton Print. 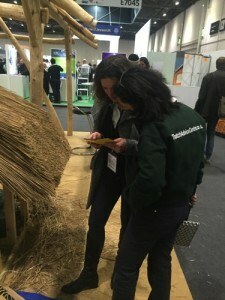 Oh and someone mentioned wouldn’t it be a good idea to have a rolling PowerPoint presentation showing thatch construction, different materials, thatch fire safety, and maintenance information. What about a file with a copy of the presentation? Yes and a file on Fire Safety and one on Thatch Construction too, so we had lots of back up information to the lovely pictures and diagrams on the walls. Shouldn’t take long! How long is that piece of string? Forget working 9 – 5!! Thatch Advice Centre is run as an addition to paid work so every spare second, evening and weekend moment was taken up with the preparation. Natural Homes were managing the Natural Building Area and it was a fantastic feat of organisation, communication and enthusiasm. Plenty of late night phone calls were made, sorting out Marketing, Health and Safety, Logistics, Paperwork, Profiles and more. Our regular Social Media Friends and Followers will know that, living in the sticks, our internet is not the fastest nor the most reliable but it held up well for this project, thank goodness. It all came together really well. We were joining 6 other natural Builders, Artizans of Wood (who were driving the lorry up with our and their materials), Straw Works Ltd, Straw Build, Earth Building UK, Mike Wye and Associates and Hempcrete. Everyone had to go up on the Monday 7th and get the stand and demo areas ready. 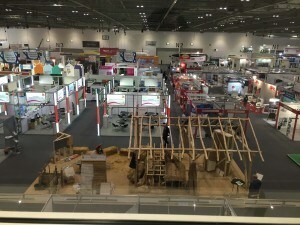 Ecobuild would then open to the public for the Tuesday, Wednesday and Thursday 8th – 10th March. 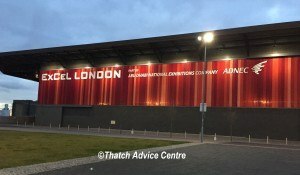 Due to a small crisis at home, we did not leave until late morning on the Monday, but we arrived, parked under the Excel building and made our way to the Exhibition. Signing in and getting our Exhibitor Passes and bags checked was first on the agenda and then off we went for a long walk – Excel building is HUGE – to find our spot. Our stuff was unloaded and placed, in no particular order, in front of our Stand. The Natural Building Area was a large rectangle with 7 stands down two of the sides with a walkway between like an L shape. The large central rectangular area was where we were going to be doing our thatching demos alongside the other natural builders. 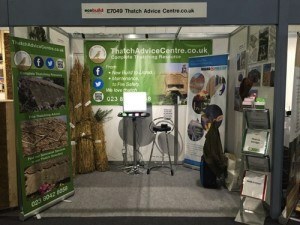 We quickly assembled the thatching frame and then set about setting up the stand. The banners, pictures, various thatching materials and tools, the table with the laptop on for the PowerPoint, cards, files and thank goodness we took a flash of coffee. Everyone was working hard and getting on with it but there was a good feeling of camaraderie and helpfulness. Some of the others had met before but for us it was all new faces and lots and lots of interesting things discussions. Several of our visitors were planning thatch projects or work on existing thatch and it was great to be able to give them advice, information and options on how to approach those plans. Food and drink were taken on the go and the days flew by, the numbers of visitors seemed to rise throughout the exhibition right up until the tanoy announced it was closed and over for another year. Then, like many ants working frantically, the exhibitors started to take everything down. 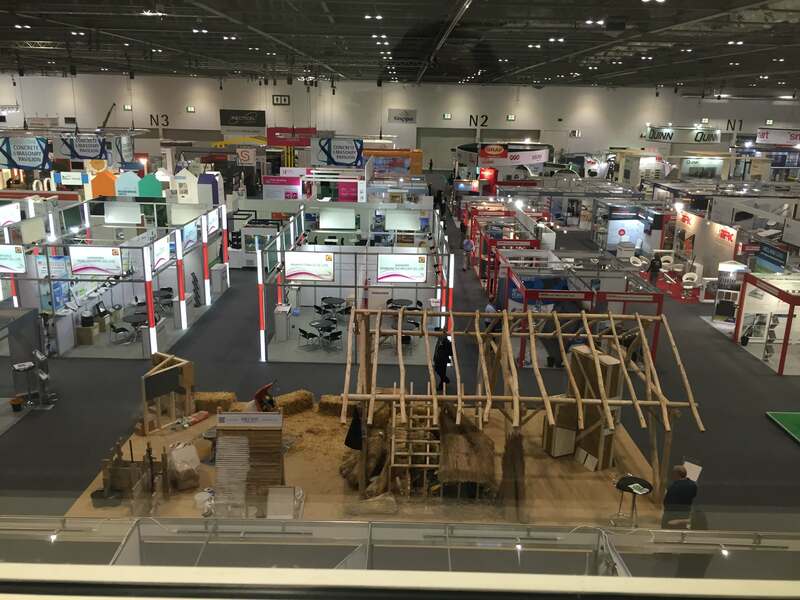 The Natural Builders worked together and dismantled their stands and the demo area – including our great big round pole building (many hands making light work) – in excellent time, stacked by the door and waiting for our vehicles to make it through the queues. Our gear went back with the long wooden poles and also some acquired straw bales! To Artizans of Wood base and we then travelled there in our vehicle to collect everything. With our Natural Building area ready, we all departed to get a good night’s sleep ready for meeting people, answering questions and also the planned thatching demonstrations. The next three days exceeded our expectations and conversations held were so interesting and, in some cases, thought provoking. So many varied questions from places such as India and Italy to meeting a young architect who lives about 2 miles from HQ! Good job we know our stuff about thatch and thatching. The Master Thatchers did a fabulous job with demonstrating Water Reed and Combed Wheat Reed applications, fixings, tools and styles. We all spent time as explaining roof construction, building regulations, chimneys, materials, design, longevity, training, as well as fire safety and even insurance. The final great thing about this whole experience is that we have been invited back next year! Having sat around and chatted with the other Natural Builders we have some marvellous ideas to make it even better so until then, thanks for reading this and we hope it may inspire you to visit us in 2017. In the meantime, you and your friends can sign up for our free newsletter (which goes out 4 or 5 times a year) and join us on Social Media.